Sean Spicer's resignation Friday doesn't just mean the end of his time as White House press secretary. It also likely means the end of one of the all-time great "Saturday Night Live" impersonations: Melissa McCarthy's Sean "Spicy" Spicer. "It is not too much to say that Melissa McCarthy turned in the most devastatingly effective political impression in recent 'SNL' history -- or maybe ever," said Bill Carter, a CNN analyst who has covered late-night TV for decades. McCarthy's impression of Spicer was so good that it became legendary even though she did it just four times. But it was clear from the first time she showed up behind the parody podium, in a surprise appearance, that McCarthy was going to star in the role -- the studio audience was screaming even louder for her than she was yelling in her role as Spicer. "Before we begin, I know that myself and the press have gotten off to a rocky start," McCarthy said while playing the character for the first time. "When I say rocky start, I mean it in the sense of 'Rocky' the movie because I came out here to punch you in the face." Later in the sketch, she pulled out the Super Soaker that would become a defining image of the character. After an overwhelmingly positive reaction to that first appearance, "SNL" had "Spicy" return the next week to open the show, yell at the press, and hawk shoes and bracelets from Ivanka Trump's fashion line. The caricature reportedly upset some people in the White House. Politico reported in February that Trump found it problematic that Spicer was being mocked by a woman. But that didn't certainly stop the show from bringing McCarthy back. In an April episode, McCarthy's Spicer returned again, this time dressed as the Easter Bunny, so that the fake press secretary could apologize for comments that the real press secretary had made earlier that week about Hitler and the Holocaust. "You all got your wish this week, didn't you?" McCarthy's Spicer/Easter Bunny said. "Spicy finally made a mistake." Then, in what may well have been McCarthy's last appearance as Spicer, she was paired with another of the show's beloved impersonations from this season, Alec Baldwin's Donald Trump. 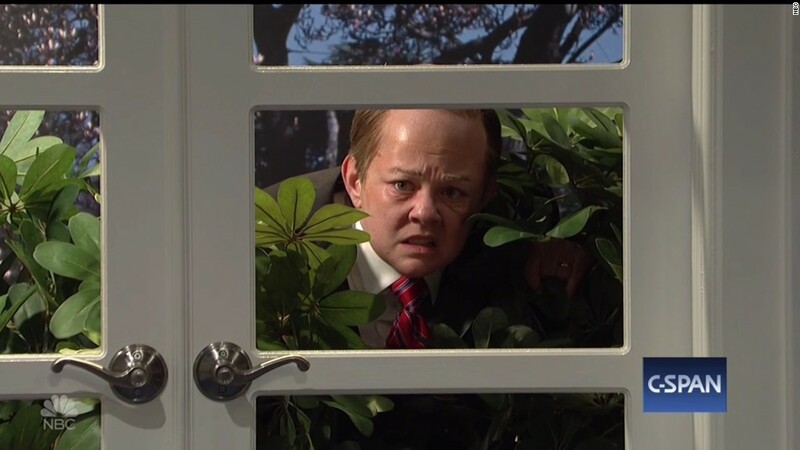 During a May episode, which the actress hosted, "SNL" had McCarthy's Spicer hide in the bushes, take back the lectern from Aidy Bryant's Deputy Press Secretary Sarah Huckabee Sanders, and set off into the world to find Trump. "Have you ever told me to say things that aren't true?" McCarthy's Spicer asked Baldwin's Trump. "Only since you started working here," he responded. Then Trump requested a kiss from Spicer, which led McCarthy and the series to a bit of foreshadowing. "Is this like 'The Godfather' where you kiss me and no one ever sees me again?" McCarthy's Spicer asked. "Yes," Baldwin's Trump said, then kissed her. But while we may never see "Spicy" again on "SNL," the show will undoubtedly be able to find others in the White House Press Office to lampoon. "I know SNL fans are sad about Sean Spicer," Bryan Tucker, the co-head writer for "SNL," tweeted. "But his replacement is a guy with no government experience called 'The Mooch.' So it'll be fine."